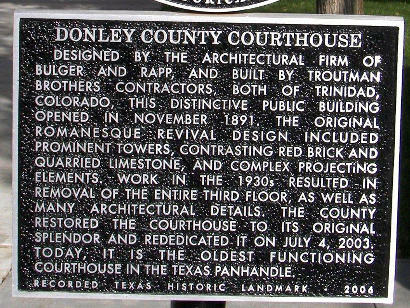 Donley County Courthouse, Clarendon Texas, Recorded Texas Historic Landmark. If you're like me, when you hear the name Texas Panhandle, you probably think blue northers and the Palo Duro Canyon. It gets cold, cold in the Panhandle where there's hardly anything but barbed wire fence to keep out the brisk Arctic wind in the winter. Donley County is one of the squared counties located in the Panhandle. Formerly the domain of Plains Apaches and later the Comanches and Kiowas, this region was once overrun with buffalo until White men settled in the latter 1870s. Many battles ensued between the tribes and the Whites, including the decisive Red River War of 1874-75. Thereafter, the Indians were put on reservations in Indian Territory, and the buffalo were slaughtered. With the buffalo gone, vast cattle ranches could be established. This is about when Methodist preacher Lewis Carhart established "Saints Roost" up in those parts. Actually, Carhart called his no-liquor, no-gambling Christian colony "Clarendon" after his wife, Clara. But local rowdies gave it its nickname since they weren't allowed to be rowdy there. Carhart's motto, "Christianity, Education, Temperance, Civilization - Westward," set high expectations for the townspeople. Nevertheless, a saloon and dance hall were going to be erected by some outsiders at one point. This didn't set well with several local cowboys, who offered to scalp them if they didn't leave. It took legendary cattle driver Charles Goodnight to persuade the business owners to pack up and leave. He gave them ten hours to go, and, by golly, they were gone before that. 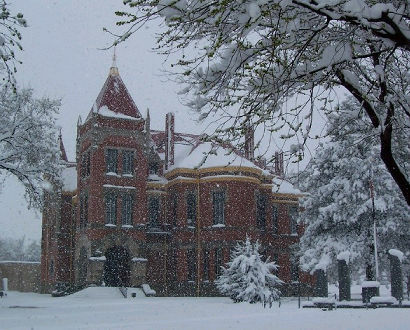 By the early 1880s, Clarendon was one of only three towns in the Panhandle. Saints Roost is now like Atlantis, under water (the Greenbelt Reservoir, to be exact). 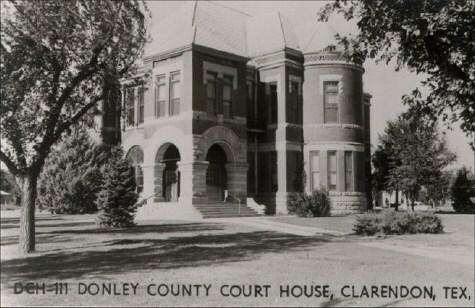 Clarendon has been the county seat since 1882. 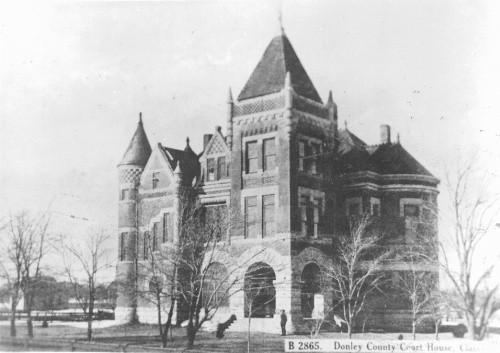 1890 Donley County Courthouse, complete with tower and turret. The Romanesque Revival stone and brick courthouse is the third temple of justice for the county. 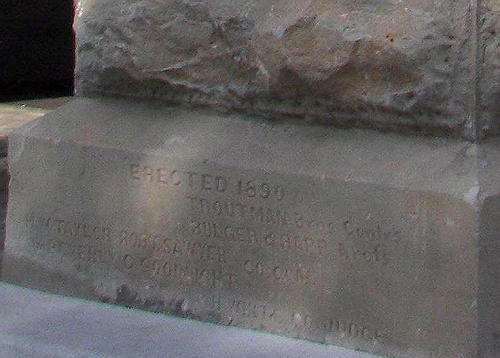 The stone base was supposedly taken from the previous courthouse, which was a two-story stone edifice. 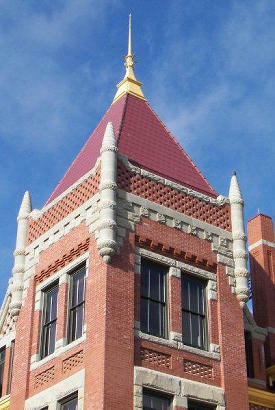 Colorado architects C. H. Bulger and Isaac Rapp had designed the current building to have a tower in the northeast corner, a conical turret roof over the stair in the southeast corner, and other decorative roof elements. The original roof had had its share of problems. It was initially sheathed with pressed metal shingles which shed water poorly. That led to damage to the interior structure. The entire third floor and the roof were removed and replaced between 1936-37. One of the most famous cases to be tried here was in November 1909 when G.R. Miller was sentenced to die for murdering two young men. He was hanged from the brand new scaffold several blocks from the courthouse in what was to be the last legal hanging in the Panhandle. I guess you can say that they built the scaffold especially for him. 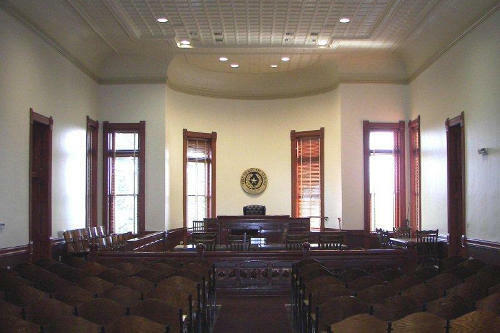 The courthouse is undergoing renovation, courtesy of the Texas Historic Courthouse Preservation Program. The word from the current judge's office is that the courthouse will look like it did when it was first built, if not better. Completion date is set for November 2002. 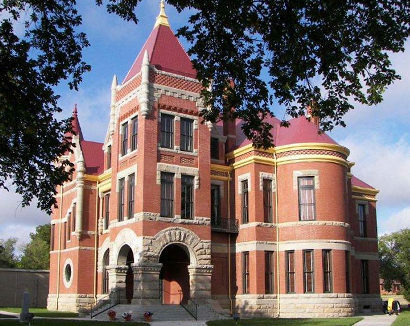 "The side of the courthouse facing W. Third St. A major undertaking of the restoration included updating antiquated plumbing and electrical systems and making the building more accessible. Large cracks in the brick and stone have been repaired along with the sections of mortar that had deteriorated and sections of the cornice which had fallen off. Holes in the exterior had led to a major bat problem in the attic." "Courthouse back facing S. Jefferson St. A breezeway separates the small back section from the courthouse main." 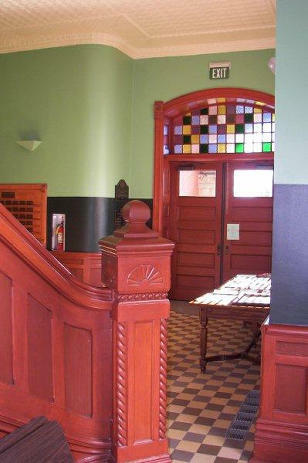 View of front entrance from the staircase. 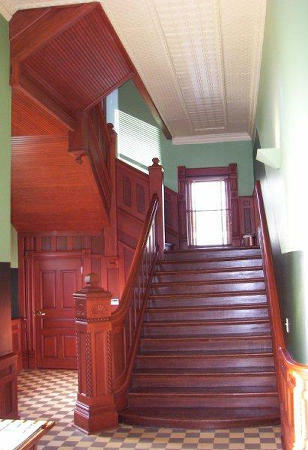 "Staircase inside the front entrance. 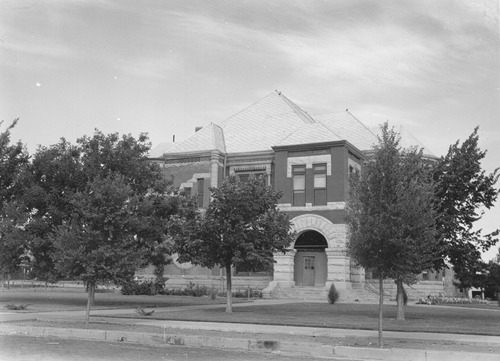 The stairs lead up and turn into the left corner tower on the front side of the courthouse as evidenced by the stair-step windows on the front of the building." "The second floor district courtroom spans the building. A painting of the county's namesake, Stockton P. Donley, is displayed at the rear of the courtroom." 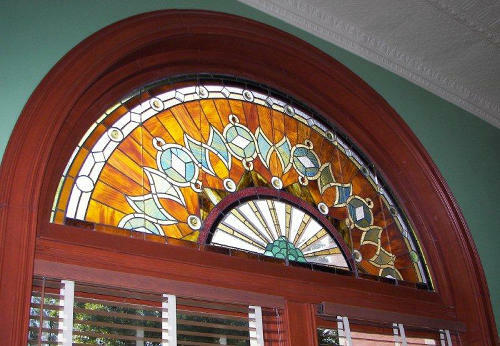 "The stained glass in the front central window. Private donations and the generosity of county citizens made it possible to restore many things that the grant money from the Texas Historical Commission did not cover." "First floor hallway. 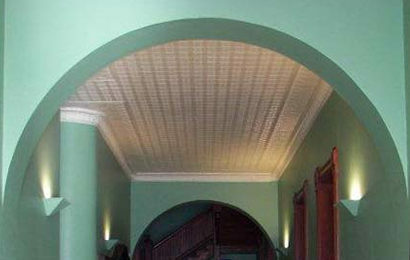 From what I've read, the pressed metal ceiling was not an original feature of the courthouse and was added about ten years after it was built." 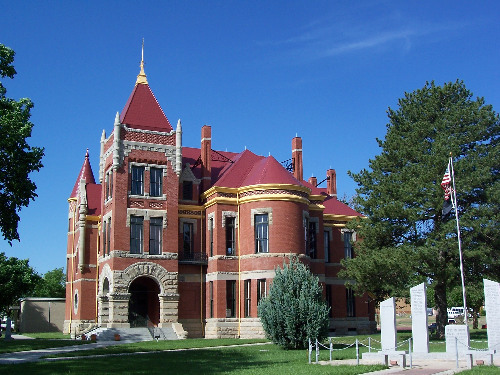 Designed by the architectural firm of Bulger and Rapp, and built by Troutman Brothers Contractors, both of Trinidad, Colorado, this distinctive public building opened in November 1891. The original Romanesque Revival design included prominent towers, contrasting red brick and quarried limestone, and complex projecting elements. Work in the 1930s resulted in removal of the entire third floor, as well as many architectural details. 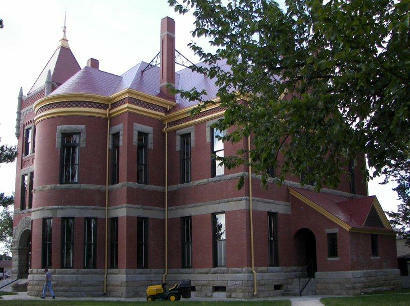 The county restored the courthouse to its original splendor and rededicated it on July 4, 2003. 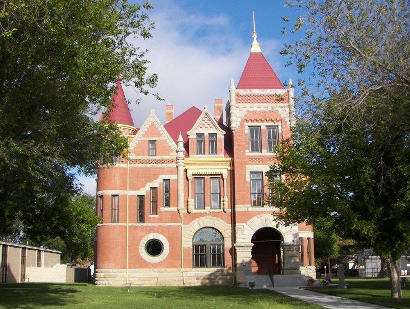 Today, it is the oldest functioning courthouse in the Texas Panhandle.